The Printrbot Simple Metal can be purchased (assembled) for as little as $599 making it a remarkable unit for even the most timid maker. I’ve had my PSM for almost a year now and printed 2kg worth of PLA on it in that time, so I’ve got a bit of experience under my belt. This was also my very first 3d printer, and I’ve used it for my business making custom chocolates. In that time I’ve learned that, out-of-the-box, the PSM needs a few additional items to really make great prints. To that end, I wanted to write this post to help other owners get the most out of their little printer. Alas, currently a faulty wire for the auto-level probe (induction sensor) has also given me a little spare time before dealing with that repair (not uncommon unfortunately). There are 3 categories for this guide: Printed add-ons, temperature and curling, and software settings. This entry was posted in 3D Printing and tagged 3d printing, printrbot on February 28, 2015 by Mario Lurig. 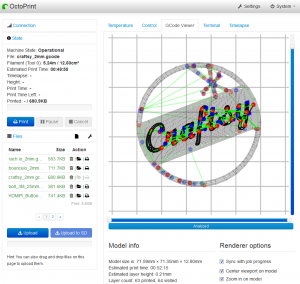 First and foremost, OctoPi is a fantastic pre-built image for a Raspberry Pi (Model A, B, or B+) that is designed to connect to your 3d printer and provide a web interface to interacting with your printer, all using the simple and powerful OctoPrint software. In my case, I’m connecting it to my Printrbot Simple Metal. 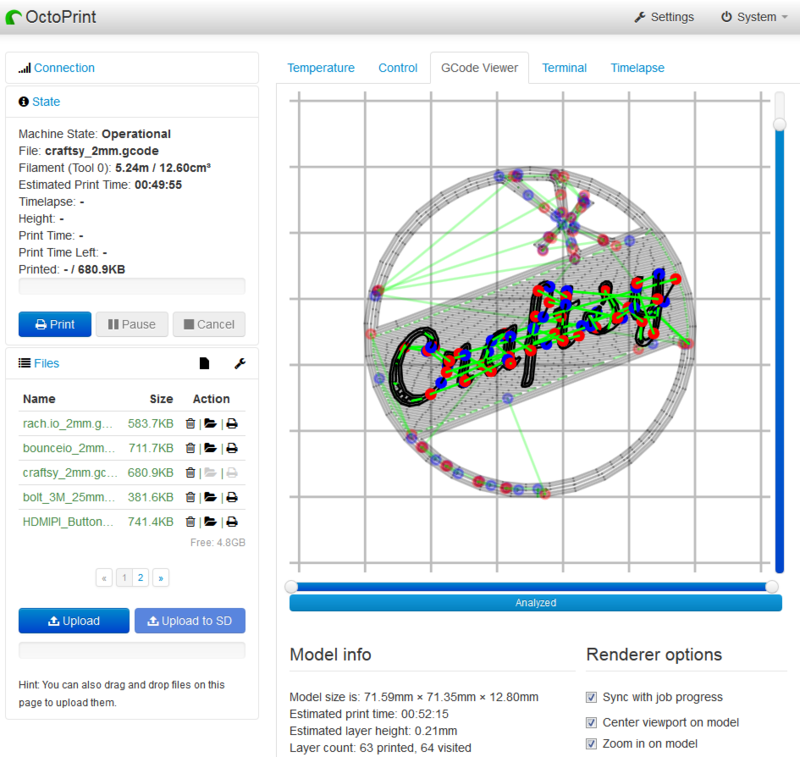 OctoPrint is incredibly powerful: you can connect a Raspberry Pi camera, print out a camera mount to attach it to your bed and actually watch your printer through the OctoPrint webpage (or record video, if that’s your thing). You could even do it in complete darkness (with IR LEDs). I have my printer in the same room, but it’s good to dream. This entry was posted in 3D Printing and tagged 3d printing, octopi, octoprint, printrbot, raspberry pi on December 27, 2014 by Mario Lurig.